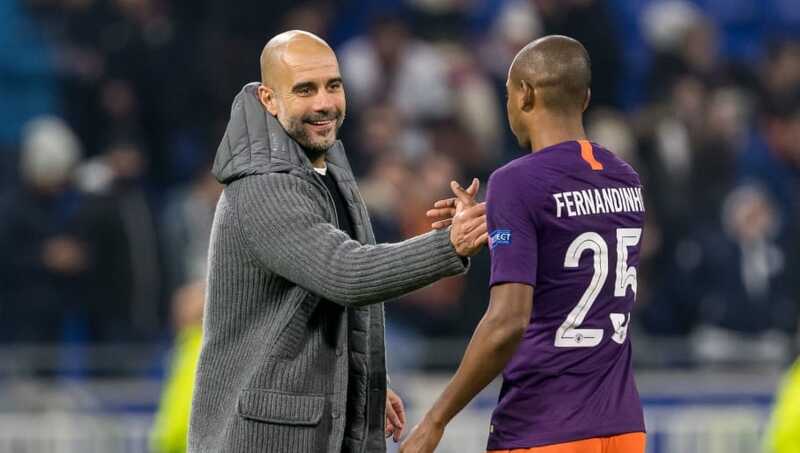 ​Manchester City manager Pep Guardiola has claimed midfielder Fernandinho can remain with the club for years to come if he can adapt his playing style and become a centre-back. The Brazil international has been an integral part of the Citizens' side for five and a half seasons, and has helped the side win two Premier League titles during his time at the club. Only recently has the 33-year-old received the deserved mass recognition for his important role in the side, after the club suffered a wobble during his absence with injury in December. Speaking ahead of his side's ​Premier League clash against ​Chelsea, Guardiola revealed via the Mirror his idea to keep Fernandinho at the club despite his advancing footballing years, saying: "He is fast, he is strong in the air, good at going backwards and when he sees the football in front of him, his vision for the pass inside or switch of play is excellent. A win for ​Manchester City on Sunday afternoon would see them move ahead of ​Liverpool on goal difference, but the Reds will have a one-game advantage over Guardiola's side regardless of the outcome. Meanwhile, ​Blues boss Maurizio Sarri has claimed that City have one of the best midfield line-ups in the world. The ex-Napoli boss said the likes of Kevin de Bruyne and Bernardo Silva are among the most technically gifted players in Europe, but contended that his team would still be able to play their natural game if linchpin Jorginho was once again nullified by the opposition.